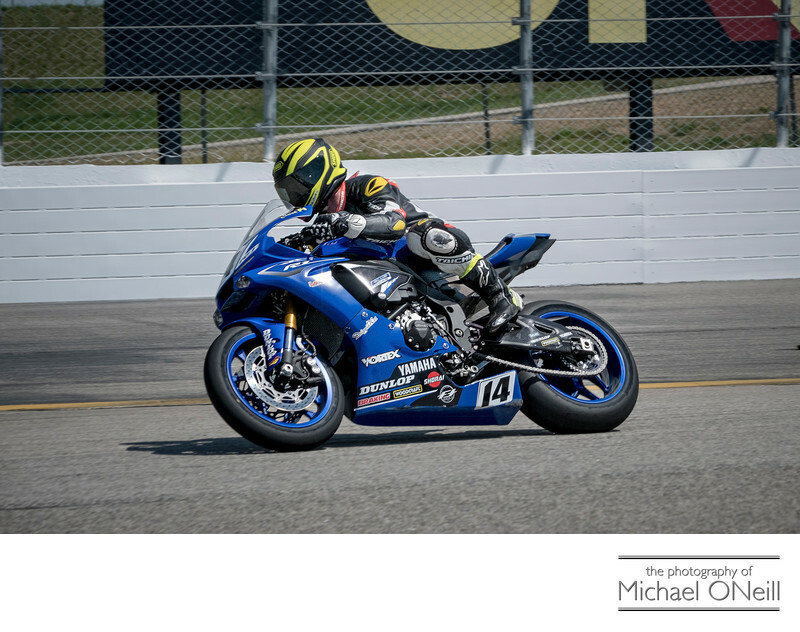 This Yamaha R1 motorcycle was captured coming out of turn 10 at NHMS (New Hampshire Motor Speedway) This competitor in The Loudon Road Race Series is charging towards the esses which start at turn 11. Road racing, be it motorcycles or sports cars, is my favorite type of racing to cover for motorsports magazines or on advertising or public relations work for individuals, race teams or sponsors. The location of my studio on Long Island, New York makes travel to some of the most beautiful road courses in the country easy. In addition to New Hampshire Motor Speedway I find myself regularly photographing events at Watkins Glen International, Thompson Motor Speedway, New Jersey Motorsports Park and Pittsburgh International. I recently covered two NHRA national events (The New England Nationals in Epping, NH and The Summernationals at Raceway Park in Englishtown, NJ) for a major motorsports magazine. I have even covered a Monster Energy monster truck event right here on my native Long Island. I am available for assignment anywhere in the world and welcome the opportunity to be a contributing photographer to any major magazine or internet news organization. Photographing motorsports of any type is what I love to do. Photographing motorcycle and automobile road races is what I love the most. If you are looking for some dynamic photography in the world of motorsports…be it road racing, drag racing, circle track racing, motocross, arenacross; even monster trucks…give me a call. I would love to collaborate with you and your people.